A slowing economy and increasing market maturity are driving down the growth of the insurance industry in Korea. Premium income is expected to decline by 0.8 percent to KRW 198.3 trillion in 2019 from KRW 199.9 trillion in 2018. The nation's GDP growth is projected to slow to 2.7 percent in 2019 from 2.8 percent in 2018, putting pressure on insurance market growth, according to the Korea Insurance Research Institute. New business premiums are likely to dip sharply in most lines of business except for variable savings life and long-term accident and health products. In particular, new business premiums from savings insurance will continue to slump, with general savings life insurance forecast to post a compound annual growth rate of minus 40.5 percent between 2016 and 2019. The life insurance market is expected to decline by 3.8 percent next year, with total premiums projected at KRW 104.8 trillion. This downturn reflects a continued fall in savings insurance premiums, driven by potential pressures on insurers' capitalization upon the adoption of IFRS17. Another downside factor is an increase in policy surrender amid rising household debt. General savings life insurance premiums are expected to decrease by 17.4 percent to KRW 26.3 trillion in 2019, which compares to KRW 44.3 trillion in 2016. Meanwhile, sales of variable savings policies are likely to grow, with premium income estimated to reach KRW 18 trillion. Premium income from protection policies is projected to grow by 1.6 percent in 2019. The pace of growth continues to slow down from 2.1 percent in 2018 and 3.6 percent in 2017. Although life insurance companies have been focusing on selling protection products such as long-term health care and critical illness policies instead of savings products, the business of protection insurance remains under pressure due to the high degree of saturation of the whole life insurance market and a rise in policy cancellation. However, the trend of the development of various types of health insurance coupled with increasing demand for variable insurance may help boost the growth of the market. 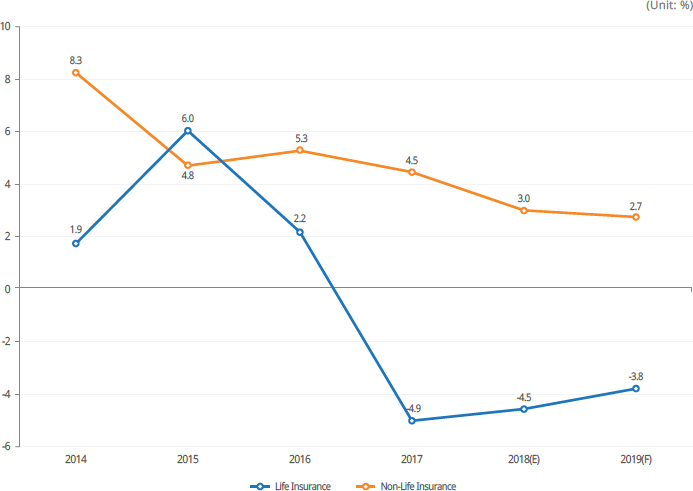 Non-life premium income is anticipated to grow by 2.7 percent to KRW 93.5 trillion in 2019, backed by long-term accident and health insurance as well as general property and casualty (P&C) insurance. The growth rate of non-life premiums keeps slowing from 5.3 percent in 2016 to 2.7 percent in 2019. The motor insurance sector will remain weak while savings insurance premiums will continue to shrink. By line of business, the long-term accident and health insurance market is projected to keep expanding, albeit at a slower pace, on the back of medical expense insurance and simplified issue insurance. Savings insurance premiums are set to decline further by 28.6 percent to KRW 3.3 trillion, and the individual annuity sector is also on the decline, with premium income expected to fall by 5 percent to KRW 3.4 trillion. General P&C insurance will likely outperform the overall market with an estimated growth rate of 8.4 percent. Casualty lines of business and surety insurance will be major drivers, and the expansion of mandatory insurance such as disaster liability insurance is also supporting the growth of the general P&&C insurance market. Motor insurance premiums are projected to grow by 0.5 percent to KRW 17 trillion, and one of the reasons for the slow growth is premium rate decreases driven by increasing popularity of usage-based pricing plans.